Download "WHITEPAPER. 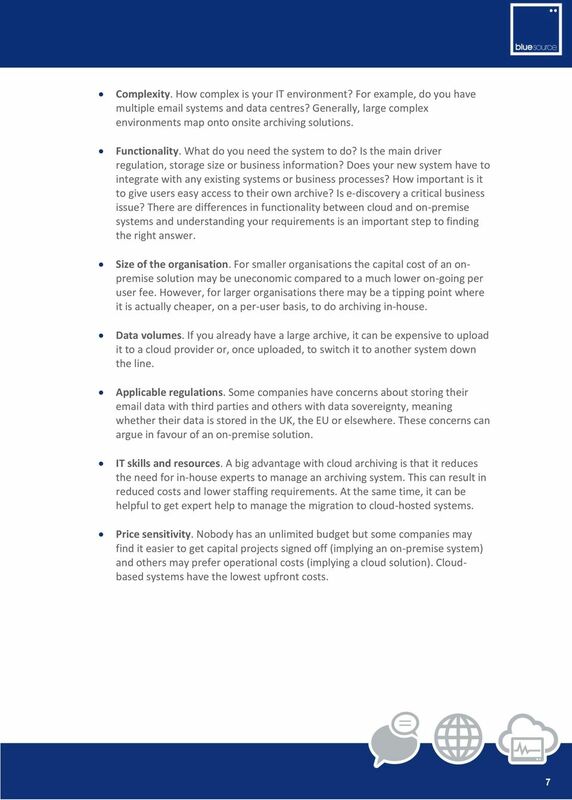 Cloud, On-premise or Hybrid? 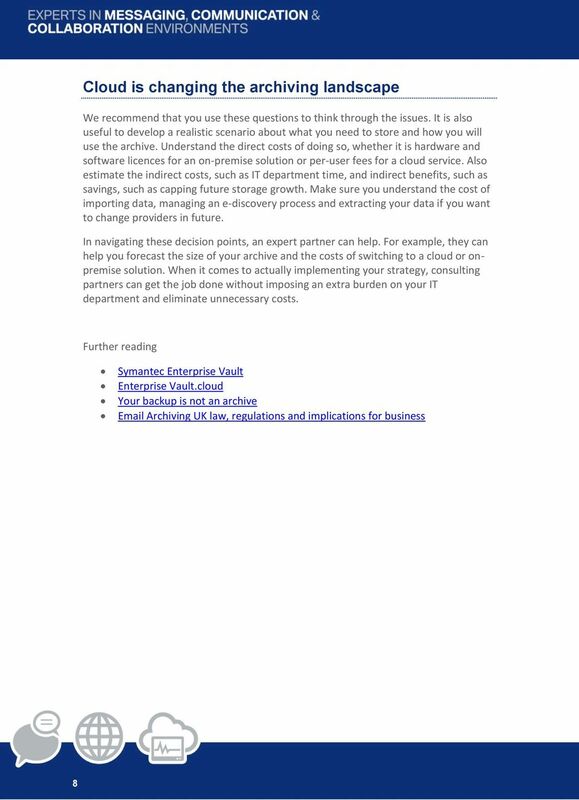 Deciding Factors for Choosing your next Data Archiving Solution"
2 Cloud, On-premise or Hybrid Deciding factors for choosing your next data archive solution Executive summary Companies buy archiving systems to reduce the cost of storage, to comply with regulations and to give staff better access to business information stored in archives and a way to make e-discovery more efficient. 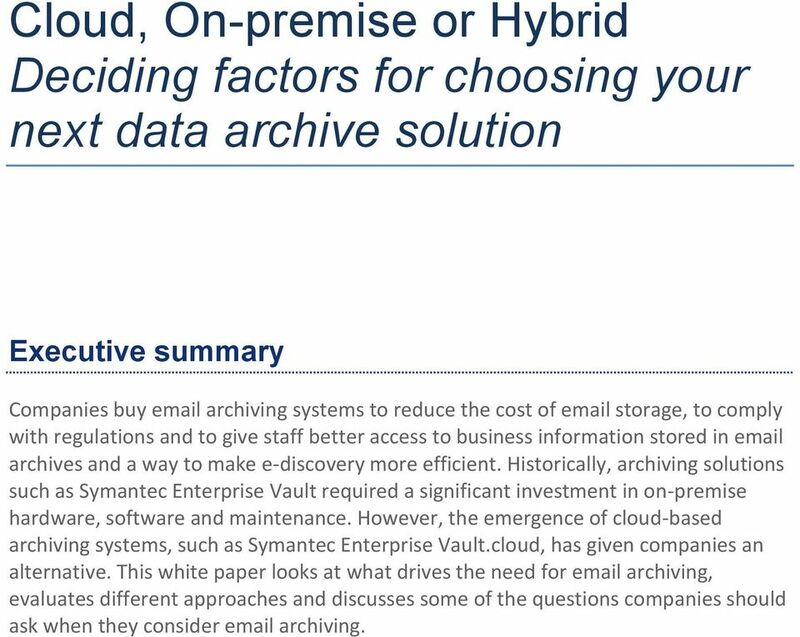 Historically, archiving solutions such as Symantec Enterprise Vault required a significant investment in on-premise hardware, software and maintenance. However, the emergence of cloud-based archiving systems, such as Symantec Enterprise Vault.cloud, has given companies an alternative. 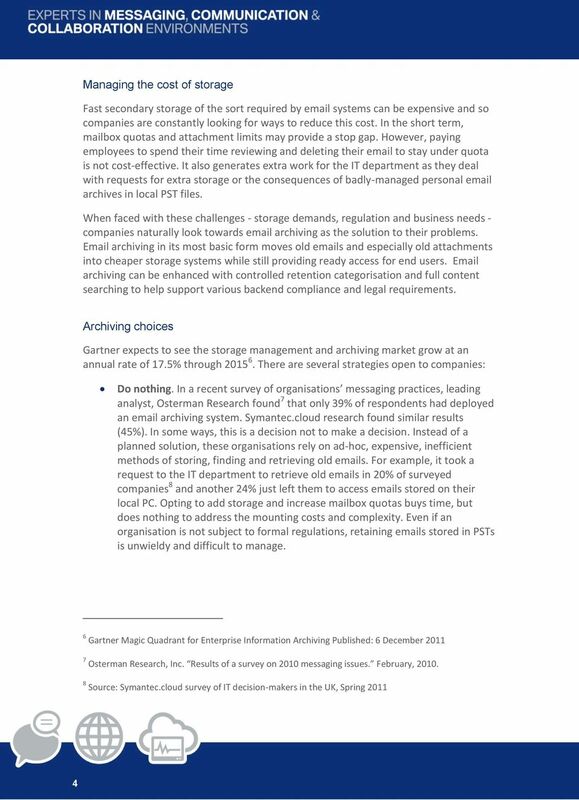 This white paper looks at what drives the need for archiving, evaluates different approaches and discusses some of the questions companies should ask when they consider archiving. 9 About bluesource Symantec s leading pure play expert in Archiving & ediscovery, bluesource is an officially recognised Technical Support Provider, Enterprise Vault Master Specialist and Symantec Platinum Partner. bluesource is also a Symantec.cloud Certified Partner, the highest tier of accreditation for Symantec s industry leading Software-as-a-Service archiving, messaging and web security portfolio. The company has been deploying Enterprise Vault in complex, multi-tiered enterprise environments for over 10 years, integrating Symantec s technology for clients that demand unparalleled quality and expertise from their IT partners. 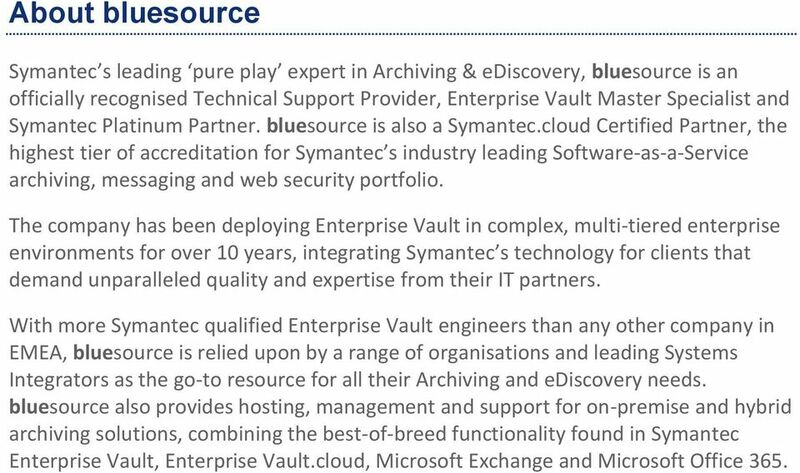 With more Symantec qualified Enterprise Vault engineers than any other company in EMEA, bluesource is relied upon by a range of organisations and leading Systems Integrators as the go-to resource for all their Archiving and ediscovery needs. 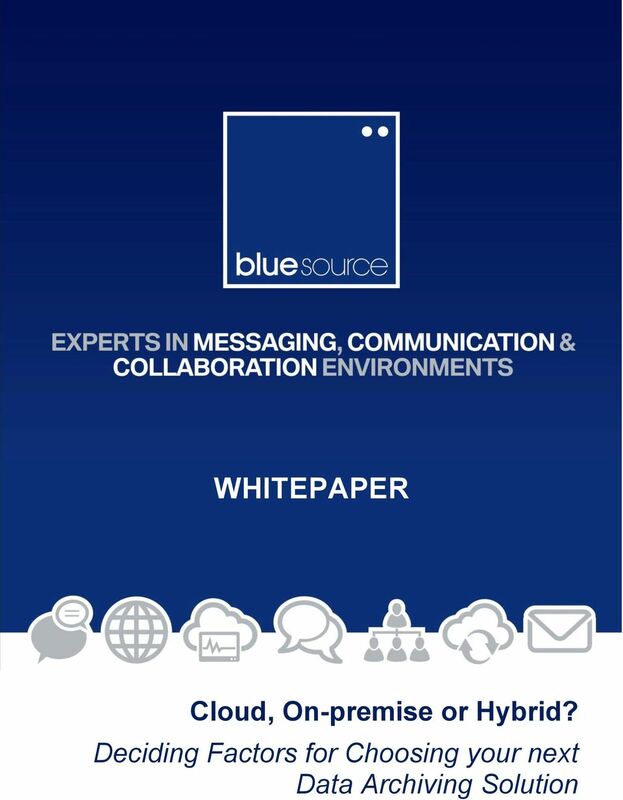 bluesource also provides hosting, management and support for on-premise and hybrid archiving solutions, combining the best-of-breed functionality found in Symantec Enterprise Vault, Enterprise Vault.cloud, Microsoft Exchange and Microsoft Office 365. 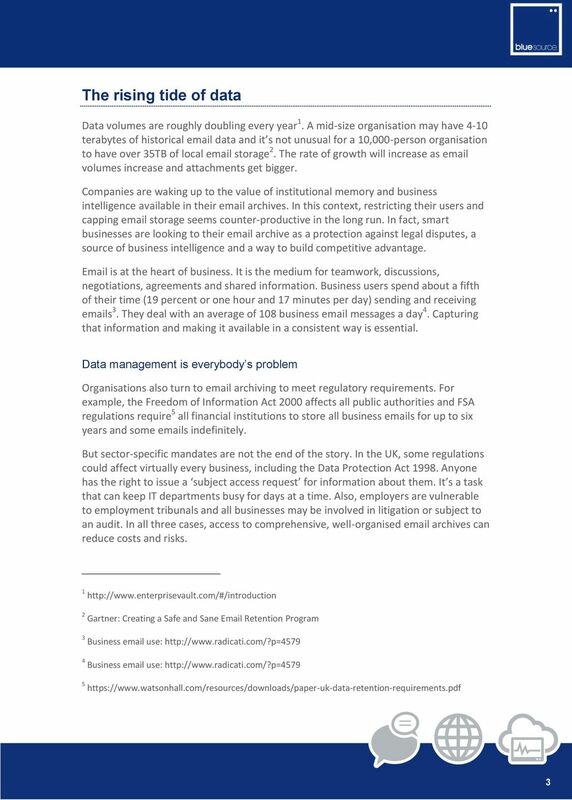 Email Archiving: To SaaS or not to SaaS? EXECUTIVE BRIEF Third-Party Archiving Solutions Are Still Needed in Exchange Environments An Osterman Research Executive Brief sponsored by Published April 2015 SPON sponsored by Osterman Research, Inc.
White Paper. 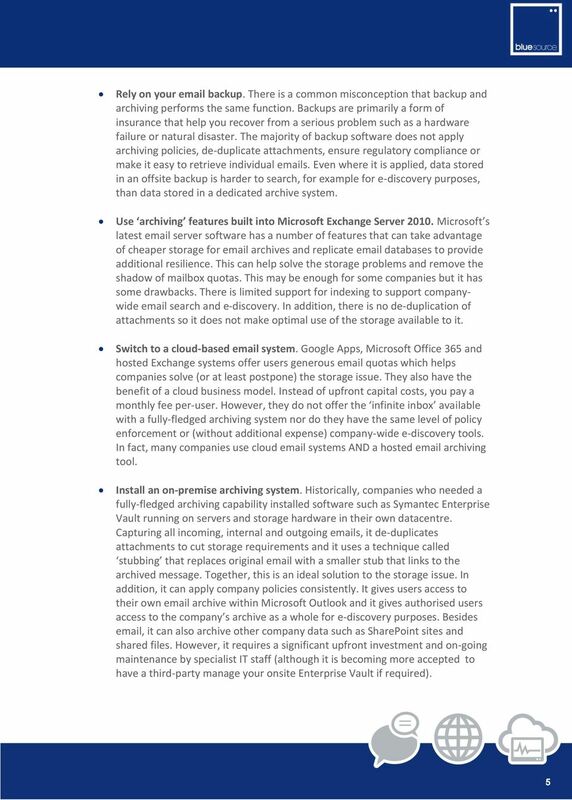 Why Should You Archive Your Email With a Hosted Service? White Paper. Lepide Software Pvt. Ltd.
Email archiving, compliance, and ediscovery solution designed specifically for U.S. financial services companies. # Is ediscovery eating a hole in your companies wallet? 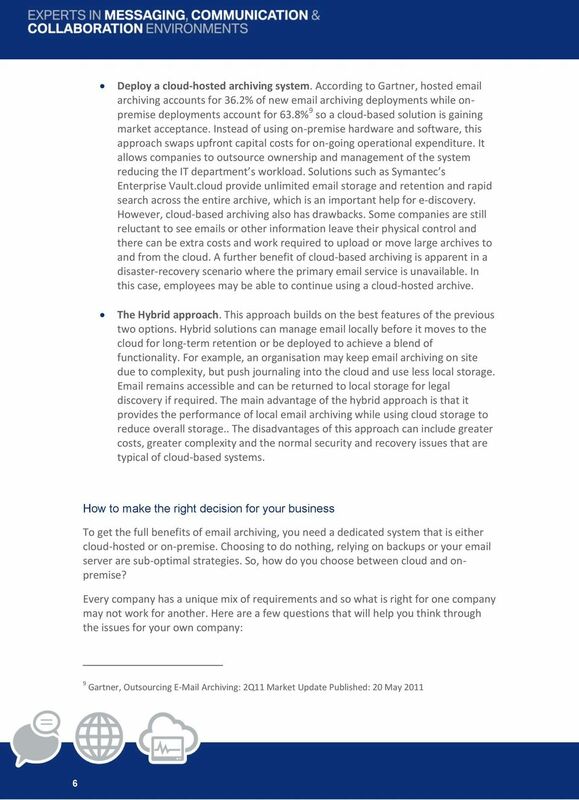 WHITEPAPER: The Business Benefits of Email Archiving The Business Benefits of Email Archiving Email archiving is an essential business tool for which the benefits go far beyond the realm of the IT department. TO BE OR NOT TO BE (Archiving), That is the question! CIBECS / IDG Connect DATA LOSS SURVEY. 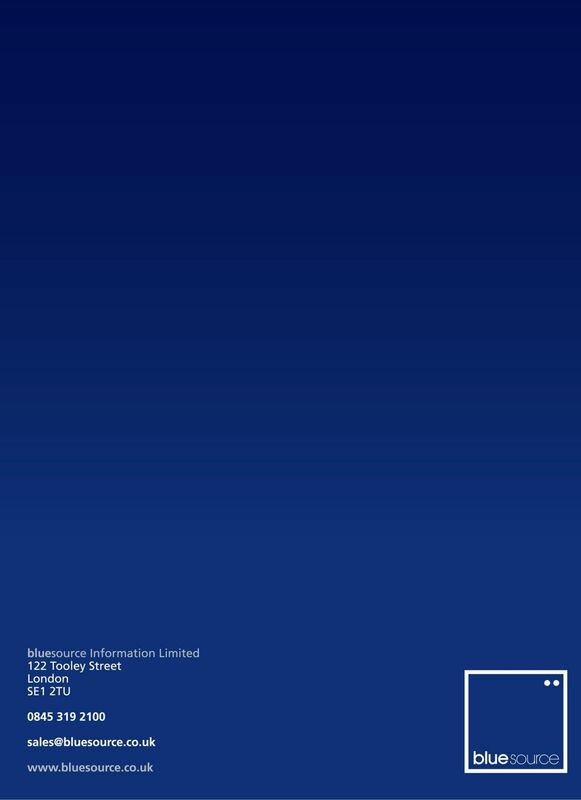 The latest statistics and trends around user data protection for business. www.cibecs.